This translates, more or less, into countering state-sponsored foreign propaganda with state-sponsored domestic fact, an initiative which may play directly into the hands of adversarial propagandists in the Kremlin. U.S. Congressional Representatives, such as Ted Lieu (D-CA) and Joaquin Castro (D-TX), have even urged the State Department to assume a more aggressive posture as purveyor of truth in this regard. The west should tread carefully here. Similar to those of the past, modern disinformation campaigns are designed to coerce targeted governments into implementing oppressive domestic policies that validate adversarial narratives, and many are taking the bait. Although the vehicle of social media has certainly increased the speed by which disinformation reaches its recipients, Russian President Vladimir Putin’s efforts to sow internal division among his adversaries is in no way a novel undertaking, and western leaders should be hesitant to paint Russian propaganda as an earth-shaking revelation in the 21st century. This isn’t a reinvention of Russia’s unconventional warfare paradigm; it’s a continuation of it. By now, it is well known that Russia has an elaborate propaganda machine within its government, as reports abound concerning Internet “troll” factories, pervasive cyber-attacks, and the proliferation of fake news stories denigrating the United States and its allies. To the Russian state, disinformation is not only an offensive mechanism used to target the public opinion of adversarial populations, but also a sort of political immune system that protects the state and its apparatchiks from negative press at home and abroad. According to reports from the Pentagon, the Kremlin’s disinformation efforts skyrocketed after U.S. President Donald Trump authorized a missile strike on targets that supposedly housed chemical weapons used by Syrian President Bashar Al-Assad, a longtime ally of Russia. As a former intelligence officer who studied the cultures that defined Russia’s adversaries, Putin is in his element employing these methods, and he has an ample supply of best practices to explore. The legacy of Soviet foreign policy in the Middle East is a good place to start. During the early years of the Soviet Union, for instance, Vladimir Lenin had dreams of conquering Asia. He believed certain populations in the Middle East resembled the mir of Tsarist Russia, a demographic that allowed the Bolsheviks to circumvent Karl Marx’s obligatory step of capitalism on the road to communism. By 1920, there were prominent Communist parties in nearly every Middle Eastern country. The goal of these parties was less to turn the Middle East Marxist, and more to expel capitalist influence by labeling western culture inherently wicked. Rather than defending the secular principles of communism in the religious Middle East, Soviet leaders realized it was more profitable to simply promote a disdain for the social, political, and economic constructs of the west. This contempt became a unifying common denominator. In the 1940s, Lenin’s policies progressed under Stalin and manifested in the form of radio stations, political parties, and student groups throughout the Middle East that agitated local populations to support anti-western worldviews. Nikita Khrushchev later carried the torch after Stalin’s death, further loosening the reins of doctrinarian Marxism and focusing more intently on anti-westernism in his foreign policy. Soviet radio communiques described Egyptian Presidents Nasser and Sadat as American puppets during critical diplomatic junctures with western leaders, replete with charges of complicity in U.S.-backed conspiracies to colonize the Persian Gulf. These radio programs offered some Middle Eastern communities their only source of non-state-controlled news, which was highly appealing to youths. Demand for Soviet literature spiked as Socialist student bodies thrived in Iraq, Syria, Egypt, Palestine, and Jordan as a result. George Kennan, who helped craft early containment policy, was one of the first to make the existence of these methods known to U.S. officials in 1947. In his famed long telegram, he describes how Soviet policies aimed “to increase social and industrial unrest, [and] to stimulate all forms of disunity” among western powers by setting elements of society against each other. Putin’s adventurism breathed new life into these supposedly antiquated techniques by augmenting them with modern technology, while the conflicts in Chechnya, Georgia, and the Ukraine provided opportunities to test their residual merit. Although Putin is certainly no devoted Marxist, much of his political agenda remains tied to the idea of Russia and the United States as inconsolable adversaries. His efforts in Syria, Ukraine, and Venezuela have all been interpreted as a means of projecting power and influence westward, and not necessarily within those states. The Kremlin’s ostensibly benign news outlet, Russia Today, draws at least 50% of its online traffic from viewers in the United States. This popularity has given some officials pause, leading to demands for the news outlet to register as a foreign agent, considering it often peddles in disinformation while presenting itself as a candid alternative to western news media. The joining of social media and disinformation to sway public opinion is not remarkable. Rather, it is the inevitable expression of an age inundated with free-flowing information and the widespread expectation of instant gratification. If Kennan framed the Cold War as a period of hyper political tension between great powers short of direct conflict, then the assumption that these conditions disappeared along with the Berlin Wall is a profound fallacy worthy of a final resting place. To the contrary, as the tools of global disinformation yield greater returns on investment, authoritarian states will rely upon them increasingly to pursue their interests below the threshold of armed conflict with other power players. A global mêlée between state-sponsored fact checkers may be a battle in which liberal democracies enter at a handicap—and fashionably late to boot. One does not have to pry open the Cold War history books to find evidence that the instruments of national power have been leaning in the information-centric direction for decades. 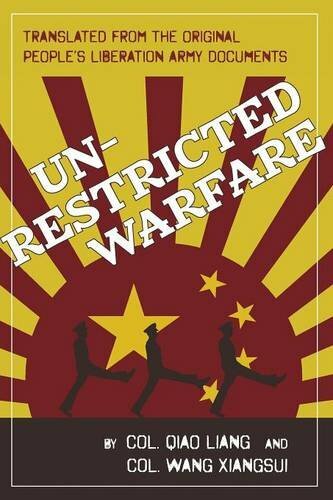 In 1999, after witnessing the projection of U.S. Military power during the First Gulf War, two Chinese Army officers published a lengthy and widely read thesis entitled Unrestricted Warfare. The authors recognized the U.S. Military was uncontested in the existing domains of war (air, land, and sea). They further concluded that if China were to remain competitive, it must target and destabilize the U.S. more comprehensively through non-military ways and means, including forms of economic, psychological, cyberspace, and information warfare. Proof that these recommendations were heeded by the People’s Republic of China is evident in the most recent White House report on the matter. While much of the western world relished the Cold War’s end and later focused on combating the support networks of globalized insurgencies based in the Middle East, competitors saw vulnerabilities. Russia and China used the interwar period between the First Gulf War and the Global War on Terrorism as an opportunity to sharpen their competitive edge in emerging domains of warfare, rather than blunting it as western nations are prone to do between wars. Western leaders now face the challenge of responding to these threats without implementing counterproductive policies that restrict freedom of speech and cripple public access to information. Unfortunately, this seems to be the preferred response. It is important to note that government overreach is an intended reaction to disinformation campaigns, much as it was for the socialist revolutionaries in Tsarist Russia who sought to cultivate support for their movement by provoking the royal family’s hand, or the Soviet intelligence officers who demonized 20th century officials in the Middle East who parlayed with the west. Inciting authoritarian policies that vindicate existing anti-government narratives has been the hallmark of disinformation campaigns for centuries. In response to the growing prevalence of false and misleading news, Germany and France have already taken bites of this low-hanging fruit by proposing laws of questionable compatibility with traditional liberal values. One such proposal would allow French political candidates to solicit courts to order “the immediate halt to the publication of information deemed to be false in the three months leading up to an election.” French President Emmanuel Macron supports the motion. Further East, Germany has already enacted legislation that punishes social media giants for failing to remove false information from their platforms. Punishments can run to the tune of €50 million, and have already led to a deluge of erroneous administrator blocks as tech companies scramble to avoid costly litigation. The fact that this law lumps spreading false information into the same category as supporting terrorism should give readers pause. Proposed legislation in the United States that seeks to criminalize the spreading of false information knowingly is now leaning in the same direction. Rather than pursuing initiatives that use denial of access to control the public’s receipt of information, policymakers should instead aim to improve upon their internal messaging without subsidizing private sector journalism. One resource already available to western decision makers is the North Atlantic Treaty Organization’s (NATO) Strategic Communications (STRATCOM) Center of Excellence (COE) in the Baltic city of Riga, Latvia. Nestled between Estonia and Lithuania on Russia’s western border, this fusion center serves as a hub for strategic communications external to the NATO command structure. Perhaps most germane to this paper, the Center of Excellence specializes in Russian disinformation collection, processing, and refutation. Established in 2014, the center’s proximity to Russia and the intimate knowledge of the local Russian-speaking populace make it a prime location for such activities. Utilizing the resources offered by this center could save officials from potentially compromising situations in their efforts to control information within their own countries. Better yet, it might ease the temptation for draconian crackdowns on information sharing in the western world, which would play into the hands of NATO’s adversaries. Advocating for the Center of Excellence would also help expel the nagging rumor that alliance cohesion is deteriorating by centralizing NATO’s strategic messaging campaign, and nesting it with the policies of its member states. Western leaders should recognize that Putin, in the midst of his many domestic challenges, is playing a long game of political will with which he is intimately familiar. Aggrandizing his image by sapping federal resources to counter the Kremlin’s every falsehood feeds into this game. The west should not indulge its opponents by playing along. If Russian disinformation seeks to divide the west, then reinforcing western cohesion by supporting the Strategic Communication Center of Excellence and ensuring NATO members meet their mutual obligations to the alliance may be as useful in deterring malign influence as military and diplomatic power—perhaps even more so. Michael P. Ferguson is an officer in the United States Army with operational experience throughout Europe and the Middle East. He is currently assigned to NATO’s Allied Joint Force Command Headquarters in the Netherlands. The views expressed in this article are the author’s and do not necessarily reflect those of the United States Army, the Department of Defense, or the United States Government. Adam B. Ulam, “The Historical Role of Marxism and the Soviet System,” World Politics 8, no. 1 (October 1955): 33. Walter Laqueur, The Soviet Union and the Middle East (New York: Praeger, 1959), 9. George Lenczowski, Soviet Advances in the Middle East (Washington, DC: American Enterprise Institute, 1971), 53. Karen Dawisha, Soviet Foreign Policy towards Egypt (New York: St. Martin Press, 1979), 185-186. For more on this, see Robert O. Freedman, Soviet Policy toward Israel under Gorbachev (Washington, DC: Center for Strategic and International Studies, 1991), 24-25; Galia Golan, Yom Kippur and After: The Soviet Union and the Middle East Crisis (Cambridge, UK: Cambridge University Press, 1977), 242; Lenczowski, Soviet Advances, 126. A 1960 Communist Congress at a Baghdad university involved students from 75 countries. Lenczowski, Soviet Advances, 131. For the spread of Soviet literature, see Baruch Hazan, Soviet Impregnational Propaganda (Ann Arbor, MI: Ardis, 1982), 142. Leigh Armistead, Information Operations: Warfare and the Hard Reality of Soft Power (Dulles, VA: Brassy’s, Inc., 2004), 190.